It's not often I review products that I sell, but as the C-4 Owners are my first choice for barbel fishing I can't really review any others! I use them in sizes 8 through 2, selecting the hook size to suit the bait. 2s are used for 21mm pellets and double 14mm boilies, 4s for one and a half boilies, 6s for single boilies and 15mm pellets, and 8s for single 10mm pellets. What I like about the C-4 is the shape. When I tried hooks where the shank curves round more, supposedly a good shape for use with hair rigs, I found that too many fish barbel were dropping off. My thinking is that the point was only getting a shallow hold because of the angle of the point relative to the shank, and tearing out. I prefer the wider gape, and the slightly in turned point does seem to resist damage from hard river beds. Apart from the overall shape, I like the fact that they are a strong hook. I am of the opinion that you should fish as heavy as you can get away with, so I prefer to use hooks that are thick in the wire which I can't open out when playing fish. However, using 30lb braid I can still open out a size 2 C-4 when it finds its way into a snag. 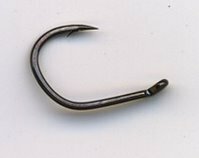 I also happen to think that hooks with thick wire are less likely to cut their way out of a fish, making them less likely to damage a fish's mouth during the fight, and with the micro barb doing no more damage than a fine wire hook when being removed by the angler.